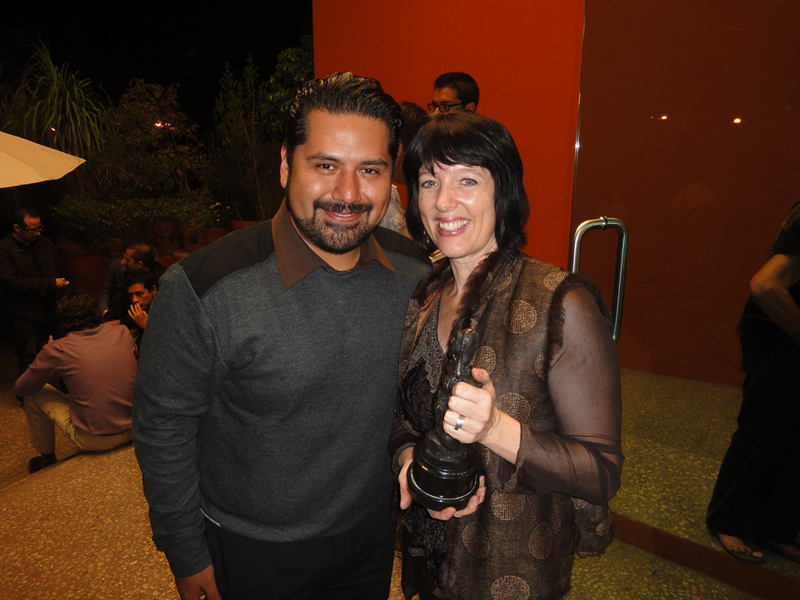 A film not to miss « "TeresaBruceBooks"
This is a picture of me with Felix Martiz, whose film was so popular at the Oaxaca International Film Festival in November that the organizers had to add three screenings. Four, actually, since Gary and I loved his “Santiago” so much we brought a screening copy back to Beaufort. The dialog and acting in this film is so fresh you feel like there is no script and that the characters are real people. We’ve screened enough independent films to know this is almost impossible to pull off, especially with low budgets. But here again Felix broke the paradigm – he made “Santiago” for $5,000 and a lot of favors. It helps that he just graduated from film school in LA and knew terrific actors just breaking into the industry. But it takes more than luck. Being able to convince people to work for nothing is where being a truly nice guy comes in. Which is another reason why so many filmgoers in Oaxaca lined up to meet Felix and see his film. Still, we weren’t sure Ron Tucker and his panel of screeners would feel the same way – it’s about a world that seems very far from Beaufort: Latin American immigrants and the street life of drugs and prostitution that sometimes proves hard to resist. It turns out they were as blown away as we were and invited Felix to the Beaufort International Film Festival. Now it’s time to see if he feels the same way about Beaufort. He’s young, Mexican-American, never been to the South, an LA-guy through and through. His film is making the big festival circuit in towns that have multiple venues, late night screenings and even later night after parties. Beaufort will be quite the culture shock – and I’m betting in a great way. It’s an intimate festival, where a big chunk of the audience is retired and watches every single movie over the course of three days. And because it’s all happening in one venue – the USCB Performing Arts Center – filmmakers don’t have to miss each other’s showings to screen their own. We’re picking Felix up at the airport Thursday and he’ll be at USCB’s Center for the Performing Arts in time to take audience questions after the 4pm screening of “Santiago.” Which should be interesting. The publisher of La Isla, Hilton Head Island’s monthly magazine for Latinos, is bringing a team of supporters and reporters. He’s fascinated by Felix’s film, not just because it deals with immigration, but because the immigrant experience in LA and here in South Carolina seems so very different. Felix’s next screenplay deals with unsafe working conditions of undocumented workers in LA factories. It’s the next generation of the immigrant struggle. In the world Felix writes about, borders have been porous and to some extent integrated, for generations. Here in the rural South, immigrants still live in migrant trailer parks, tucked away on places like St. Helena Island and Ridgeland. They’re isolated and targeted by anti-immigration bills like the South Carolina law La Isla is fighting with all the strength of the mighty pen it can muster. One of Ron Tucker’s principal goals in organizing a festival every year is to entice filmmakers here to make films. Felix may end up being one of them one day, shining a light on people right in our own state who might otherwise remain invisible. This entry was posted in travel and tagged Santiago. I am engaged, intrigued and already have my ticket in hand for the screening! Thanks, Teresa, for your hand in bringing such riches to the Lowcountry.